We don’t often flow from one direction in life to a completely different one without a bit of initial uncertainty, clumsiness, grit, and hard work. In the beginning stages of change, there may appear to be a lot of resistance to which we may find ourselves having to fight and persist in order to overcome. “Perhaps it’s not meant to be,” we may erroneously conclude, thinking that hard work is anti-flow. But we must remember that patience and determination are necessary for allowing the flow state to unfold naturally with time and experience. Classic hands-on-hips post race photo. 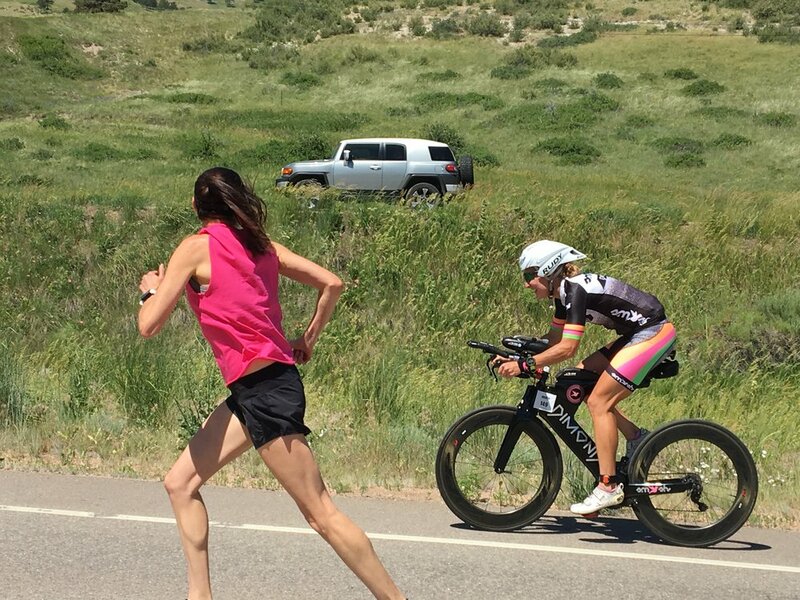 “Taryn, you’re in 5th place, gaining on 4th!” My teammate Jan’s husband, Andy, yelled encouragingly at me between miles 7 – 8 of the marathon of Ironman Boulder last Sunday. It was the best and worst news I had heard all day. 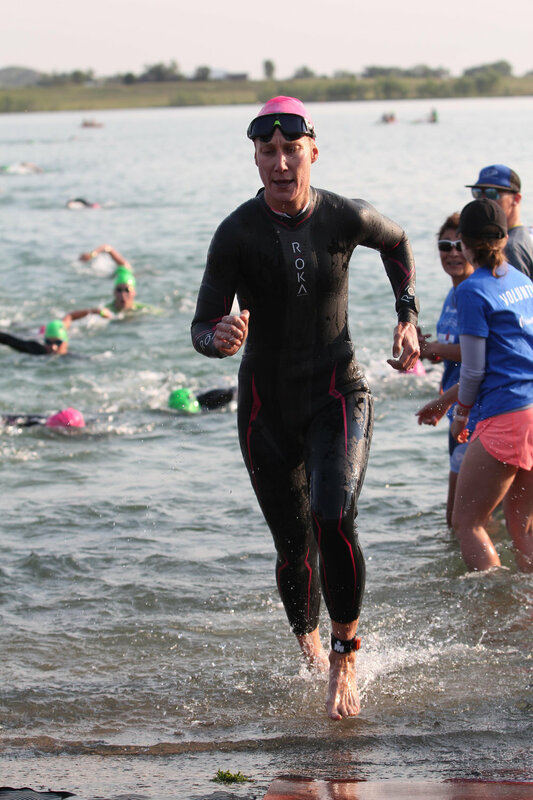 I woke up Sunday morning feeling calm, rested, and ready to race another Ironman. What is surprising about that statement is not that I felt relaxed with such a gigantic physical, mental, and emotional undertaking looming ahead of me, but that I woke up at all; I didn’t think I slept a wink. 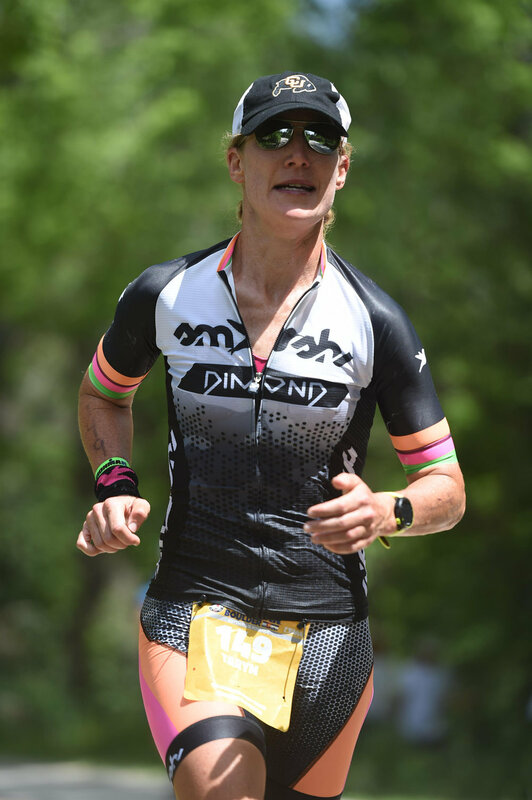 I went into this Ironman with the mindset to compete against all of the age group women, not just the ones in my 35 – 39 age group. I have never been someone who settles on one specific goal, (I was class president my Junior year of high school, then student body president my senior year), and since I already earned a Kona slot by placing second in my age group at Ironman Arizona, I wanted to aim higher for this race. My goal was to place in the top three overall. Feeling emotional at the finish. Still, I am very happy with how this race shook out because I never lost sight of that goal from 6:20A until 4:55P, and even though other women swam, biked, and ran faster than I did, (good for them), I am more motivated than ever to do whatever it takes to improve and move closer to achieving that goal. Women's 35 - 39 Age Group podium. I placed 2nd. :) Photo courtesy of Amy Hite. I also felt especially fantastic on Sunday morning because I had a secret weapon that I’ve never had access to during any other Ironman, my two best friends cheering for me on the course. My friends Emily and Hadara are the two women who have stayed by my side throughout my highest highs, and lowest lows for more than twenty years, and I was honored and relieved that I would have their support for this race. 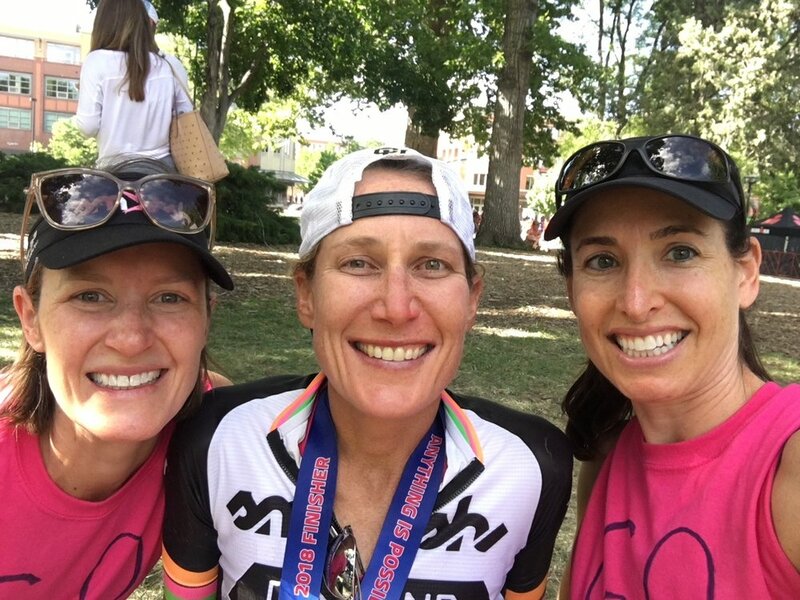 Spectating an Ironman is not an easy task, it is a long day for ALL of us, and this was their first time out, but they outdid themselves, and absolutely played a vital role in keeping me calm and confident all day. I admire them both so much, they make me want to be a better person every single day, and even though I did not want to disappoint them, I knew that they would be proud of me no matter how I performed, which gave me the freedom to give the race everything I had. My girls, Hadara Katarski and Emily Tweten. Photo courtesy of Hadara Katarski. I also had teammates racing beside me and along the course cheering all day. In essence, I was surrounded by my people, doing my favorite thing, in my favorite place, but it was still going to be a very hard day. Any sport that requires this much gear is both a dream and a nightmare. I lined up at the swim start closer to the front than I ever have. It was a self-seeded rolling start, but instead of lining up with the 1:10 hour expected finishing time folks like I did in Arizona, I stepped up, literally, and walked down the boat ramp right behind the 1:00 expected finishers. I accepted that I might get pummeled by the faster swimmers, and swam as fast as I could. It could have been altitude, or my jumpy nerves, but it took about 7-8 minutes to calm down my breathing and slip into a solid rhythm. It felt like the yellow buoys were closer than usual, because they just kept popping up, but it turns out I was just swimming fairly efficiently. I surged a few times, but mainly kept the same pace throughout the 2.4 mile swim around the Boulder Reservoir. 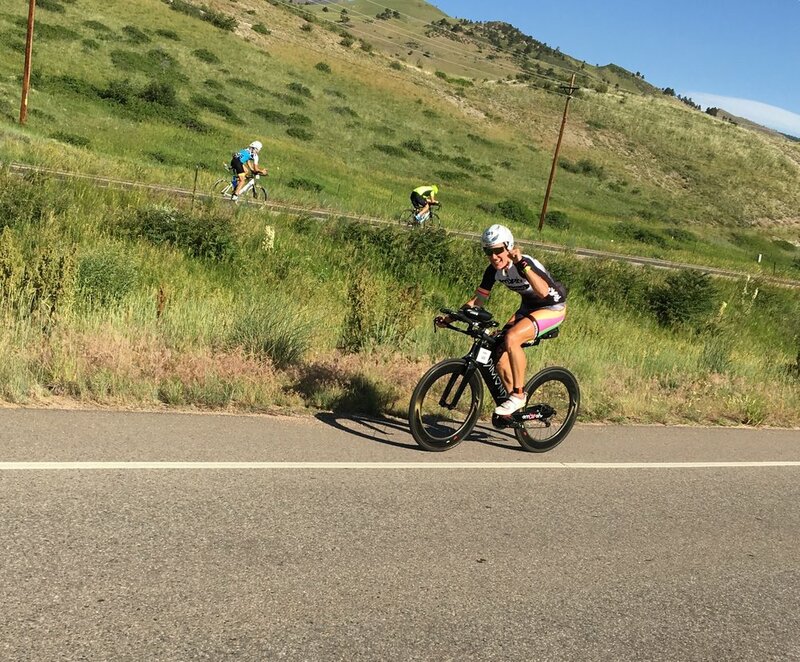 I ran out of the water feeling good about my swim, but I never time it, so I had no idea how quick it was, (for me), until I felt my teammate Lauren pat me on my back as we were running out of the transition tent toward our bikes. Lauren is an excellent swimmer, definitely faster than me, so the fact that we were in the change tent at the same time meant I had a great swim. I did. I swam a 1:07:52. 1:24, 1:14, 1:14, 1:12, 1:15, 1:35 *Ironman St. George 2012*, 1:14, 1:21, 1:14, 1:17, 1:09. I suppose dropping nine minutes from your swim time in two years is a nifty byproduct of swimming over 100,000 yards in one month, (DeSWIMber), or completing four 10,000 yard swims within six months, and/or from literally jumping into the deep end of a swim emphasized triathlon camp where former pro triathletes and Division one collegiate swimmers are adjusting your stroke, and then applying that priceless knowledge during every single one of your five weekly swim workouts for six months. Day one of TeamHPB Winter Smash Camp. Photo courtesy of Alyssa Godesky. Thankfully with that aforementioned elbow grease, my swim has improved. Bonding with my bike, Simone. The bike started off fast, Simone wanted off her leash, but considering the temperature was supposed to rise into near triple digits, staying fueled up and hydrated was the top priority. Eating one of my many 200 calorie scrumtious Picky Bars. The course was two laps around north Boulder. I did not spend a ton of time in north Boulder when I went to CU, only really passing through there on our way up to Estes Park, or on some other camping excursion, it was beautiful. The course had some challenging spots, a couple of hills, and false flat sections, but it was the heavy winds that picked up on the second lap that gave us a real slap in the face. It wasn’t pleasant, but I decided to embrace the whipping crosswinds and forceful headwinds as handy Kona practice, because the winds on the Big Island are legendary. Nevertheless, I was working through the bike leg quicker than I planned to, and was pleased to finish in 5:24:40. Pedaling up the first hill at mile 20. Photo courtesy of Hadara Katarski. Next up was my favorite part of the day, (any day), the run. Starting a marathon at 1P is never ideal. I knew the marathon would be slow for everyone, and my orders from Hillary were to just keep running, so I took a few extra moments in transition to make sure I was as comfortable as possible for my hopefully less than four hour long run. Somewhere along the course not feelin' so good. Right away I was annoyed. My watch was acting up, which was more annoying than detrimental because I was not gunning for a specific pace like I did in Arizona, but more like a loose range between 8:15 – 8:40min. mi. Once I got the watch sorted I was nearly to Jay Rd. and running toward downtown Boulder. I would have teared-up at the significance of running a marathon on the same road that I ran on many, many times training for my first marathon back in the day, but I was too hot and parched to get weepy; I needed to stay focused and keep moving forward. This is when #$@! got real. Just after mile one, I was passed by a woman with the number 23 written on her left calf. Damn. I let the young millennial go because we had over twenty four miles left to run, and since this was my 49th marathon, not my first, I knew there was plenty of room for things to go sideways if I didn’t run smart. Plus, I wasn’t able to run that fast. Just before mile three another lady ran up next to me, but she was a fiercer foe for two reasons, a.) She had a 39 written on her left calf, (same age group), and b.) I noticed her wearing a Boston marathon 2018 finisher’s shirt in transition that morning, so clearly she could run. We were shoulder to shoulder for about a mile, but I surged ahead at mile four and she did not go with me. Yes. The stretch of the course between miles 1 – 8 were on an exposed section of the Boulder Creek bike path. It was not fun. I started to pick up steam, but because of the legitimately scary conditions, I stopped at every single aid station, (every mile), to fill up my hat with ice, drink water, and Gatorade, plus douse between 1 – 3 cups of cold water on my face. This process obviously slowed me down, but it also was necessary keep me going. I was hoping to see Emily and Hadara around mile 9. I was hurting, and needed them. I was getting tired, not body tired, sleepy tired. The minimal sleep I had accrued over the previous 72 hours was starting to take its toll. “Go, Taryn!! !” Emily and Hadara shouted in unison as I trotted a about 500 hundred feet beyond the mile 9 marker, yes. I knew I looked rough, I barely smiled, I didn’t want them to worry, but it felt good to let my guard down for a minute and let them see how much this does hurt. I also saw them about three minutes after I heard Andy’s progress report, so I was in a very low spot, but then I thought to myself, That’s right, you’re not there yet, but you are on your way, and running marathons is what you do. That little pep talk did the trick, because I picked up my pace and held it between miles 10 – 16ish. I love the last ten miles of any marathon because they are so hard, and it is the place in the race when speed sputters and grit takes over, but the last ten miles of an Ironman marathon are exceptionally tough. I knew miles 18 – 22 were going to be awful because we would be running back out on the sunny, exposed part of the bike path. Sweet. I was getting sleepy again, I almost stepped off the path into some sharp rocks on one turn, (time to add some coke), but I kept going, and felt a shot of adrenaline when my droopy eyes caught a mirage of hope up ahead, a woman walking. Yes! When I finally made it to the turn-a-round at mile 21, I was spent, but realized the quicker I ran; the quicker this madness would be over. “You look so good! Great run! Great RUN!” I heard and saw a woman yell at me in between miles 22 – 23. She looked so sincere and intense, a true woman of the Rockies, I didn’t want to let her down, so I picked up my pace and tried to at least appear like I was not ready to keel over. I needed Emily and Hadara. Were they already at the finish? “Go, T!” Hadara sprinted out from the bushes along the creek just before mile 25, and ran with me for a few minutes. I couldn’t say a word, but her beautiful running gait, (she is a real-deal runner who ran with Kara Goucher on the cross-country and track teams during her years at CU), inspired me to keep my act together for one more mile. It was the longest mile of my life. Just when I thought it would never end, I saw the spritely 23 year old that passed me at mile 2 on Jay Rd. a few feet ahead of me, and gobbled her right up. The finish line was hidden behind a right turn into a hidden corner, but when I saw it, when I realized I was really there, the signature red Ironman carpet laid out before me, I almost lost it completely. Emily and Hadara were yelling hysterically as I rounded the last left turn and sprinted, (maybe), toward the finish line. The next few moments were pure bliss. I sat in the grass flanked by my best friends relieved and proud that I finished another Ironman. I knew that I did not reach my lofty top three goal, but was confident that I did finish in the top ten because I passed at least 3-4 women on the run, which is certainly a step in the right direction. I ran the marathon in 3:51:11, which gave me an overall finishing time of 10:34:45. Most importantly, I gained more experience to help execute a better race next time around. 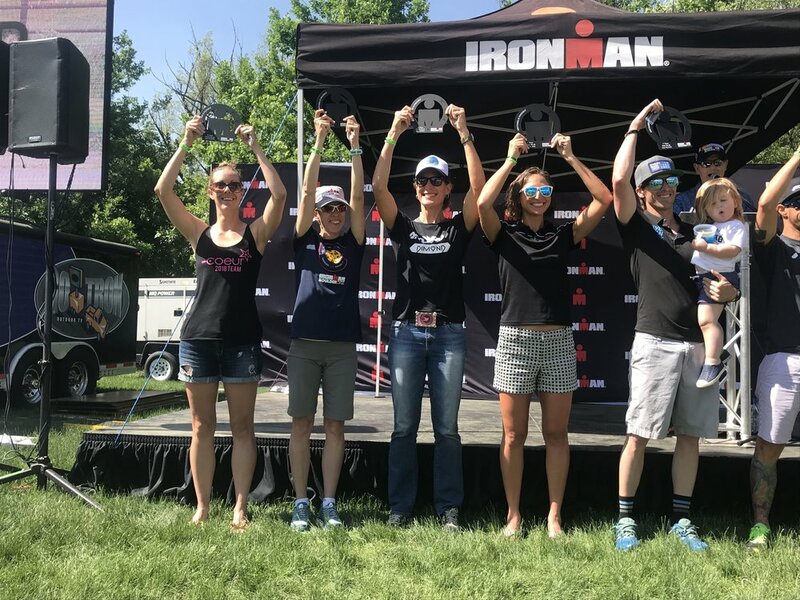 There is a lot more that I want to share about this race, and the weekend surrounding it, but I am still processing it all, so stay tuned for one more Ironman Boulder themed post next week. In the mean time, please enjoy this poignant song and video from Shawn Mendes, In My Blood.